Fountain Pen History in the United States tends to focus in the Midwest and Northeast during the first half of the 20th Century. Boston (Moore, Carter etc.. ), New York Area (Waterman, Swan, Esterbrook, Morrison, Ingersoll, Wearever…), and Chicago and the Midwest (Wahl, Parker, and Sheaffer…) were hotbeds for fountain pen production and marketing from the early 1900s through the 40s and beyond. One normally does not think of Alabama as a fountain pen distribution point, but the Artcraft Pen is an exception. Below is a photo of the simple lever filler after I have taken it apart. As you can see, the clip, cap band, lever, and nib are quite dirty, as is the barrel. The j-bar had broken off and the sac was reduced to powder. I replaced the j-bar and the sac (size 16) and trimmed them to fit the Artcraft barrel. The metal parts were polished in the ultrasonic cleaner and then using Pentiques’ scratch remover, polish and wax. Classified as a third-tier pen, it still has a few nice features. I like the stepped clip, and all of the gold fixtures polished up and there was no deterioration of the gold. Second, I like the brown swirl pattern of the plastic. It is very similar to the pattern found in the Belmont pen/pencil combination that I wrote about in the post ~ Belmont Pen And Pencil Combination In fact, if you look at the two writing instruments (Belmont and Artcraft) you will see the levers, feeds and shapes are very similar. I have no documentation as to who made these parts, but it is feasible that they came from the same factory. One of the great mysteries, at least to me, is the origin of many of the components of the pens we restore. The pen is 5 1/4 inches closed and 5/ 15/16 posted. Restored, it is quite clean and writes with a flexy medium line. 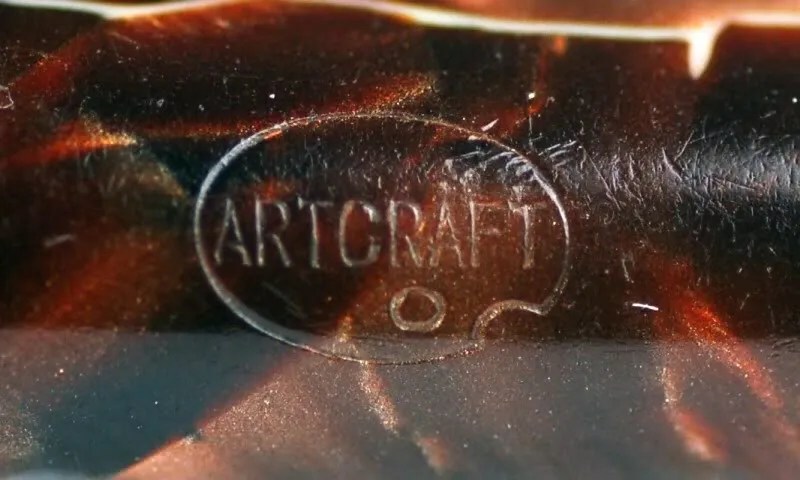 Here is a close up of the logo for Artcraft, which I believe is an artists pallet. The medium nib, with the Artcraft Pallet logo. Now for a bit of history on Artcraft Pens ~ I owe thanks to Mr. Marvin Whiting of the Birmingham – Jefferson History Museum for helping me with this research. When I found out that the Museum had an Artcraft pen in its collection, I requested his assistance with any information they might have on Artcraft. He provided me with Corporate information from the Birmingham, Alabama City Directories (1925-34). This research shows that Artcraft first appears in 1930 at 1424-26 3rd Avenue North in Birmingham, AL (this address is now a large Chevrolet dealership). The President/Treasurer was Ford D. Cromer, James G. Erwin was Vice President, and Lillian Sharpley was Secretary. In 1931, the address changed to simply 1424 3rd Avenue North. In 1932, Ms. Sharpley was no longer listed and in 1934 Harriett P. Cromer was listed as Secretar/Treasurer and the address reverted to the 1424-26 3rd Avenue. Artcraft disappears from the Birmingham records after 1934. I did some further digging on these names and Ford D. (Dalton) Cromer, was born in August 1886 in Christiansburg, VA and died in July 1967 in Birmingham. Interestingly, he was descibed as an industrialist and inventor. Two inventions were patented – a shoulder rest for a telephone in 1959 and a fountain pen in 1934 (the same year that Artcraft disappears from the Birmingham City directory. The application date of the patent is 1932. His patent is linked below. If you read the patent closely, the only aspect of the pen he is patenting is the “ornamental design”. Interestingly, the pen in the patent is identical to the pen I restored. The lever and clip have the same designs as in the patent. This would place the production of this pen somewhere in the early thirties, presumably prior to 1934. Mr. Cromer had patented these designs on the clip and lever as his own. Ms. Sharpley, who was the Secretary from 1930 to 1932 was born in 1901 and died in 1983. She was a graduate in 1923 of Auburn University (AL), where she helped start the YWCA on campus. She can be seen here in a 1922 photo. She was quite active in the YWCA nationally, starting to work there in 1933 in Baltimore, MD after her stint at Artcraft. She went to graduate school at Columbia University in New York and remained active in leadership roles for the YWCA into the 1950s. How she came to Artcraft for a few years I can not imagine. Artcraft Pens appear occasionally, but not often. I know of one collector who actively seeks them. They still are quite a mystery to me. I don’t know if they made some of the parts, or just assembled the pens in Birmingham. I also do not know how they were marketed. I did come across an Artcraft Printing Company in Mobile, AL that advertises that they were founded in 1929, but they responded that there is no relation to Artcraft Pens. I had fun exploring this little corner of Fountain Pen History, and ended up with a nice pen in the process. A very good week…. EDIT2: (11-6-09) I have received another comment from a reader in Argentina that confirms the move of Artcraft from Alabama to Buenos Aires. He states that he has a pen that has the inscription “ARTCRAFT PEN CO., ARG. INDUSTRIA ARGENTINA” on the barrel. It is black and has no logo, and a similar clip. This would seem to confirm the comment that J.G. Erwin moved the Company to Buenos Aires in 1934. This would seem to indicate that Artcraft made their own pens (or at least some parts) in Birmingham in the late 1920s. This week, I restored my first Burgundy Vacumatic. I would have to say that it is a tie between this color and Azure Blue as my favorite common Vac color schemes. At least to me, Burgundy seems to be the most difficult to locate and I am glad to have one. Below is the standard “exploded view”. The first generation vacumatic dates to the mid 1930s. The date code is worn off of this one, but if my research is correct, it was produced in the 1934-7 area. I have mentioned it before, but remember to extend the filler when removing (and inserting) it from the barrel using your vac tool of choice. Leaving it locked may damage it beyond repair. You can see that the pen arrived in good shape, with typical nib discoloration and barrel/cap ink stains. Using a combination of ultrasonic cleaner and water/qtips, I was able to remove all of the internal ink stains. The old diaphragm was hard-stuck to the barrel. This is my new word for a diaphragm that has almost become part of the barrel as it has been in the barrel for so long under the pressure of the filler. Some Vacs have softer diaphragm remnants that are easily removed (scraped) from the barrel and some require several sessions ~ this was the latter. Upon completion of the diaphragm removal, I removed the old pellet from the filler (this is a first generation lock-down). I used a debutante diaphragm and inserted it on the filler (see various Vacumatic Posts for process and photos ~ list at right under Parker Vacumatic). Here is the completed pen. It measures 5″ closed and 6 1/8″ posted. Several factors make this pen attractive. 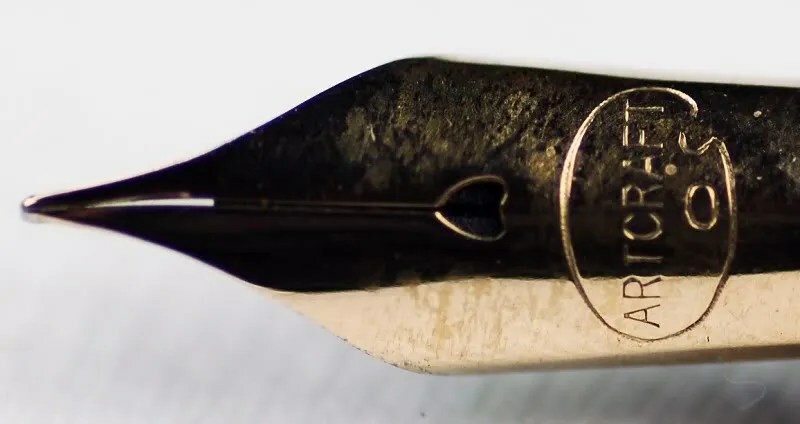 The burgundy color and gold furniture provide a good contrast, the nib is my favorite common vac nib with the gold arrow surrounded by the silver border, the burgundy striped double jewels, and finally the nib is a broad. I have immediately put Quink Blue Black ink in it and it writes a very broad line. Most of the Vacumatics that one runs across are fine to medium, and though I am not a broad nib fan, it is a nice change. The only blemishes are a slightly curved cap band (middle) and a blind cap that is quite a bit darker than the rest of the pen. I have mentioned this before, but these first generation vacs with their lockdown fillers, which allow for a longer section which matches the barrel and the double jewels, are the most collectible vacumatics, in my opinion. Thank you, as always, for the emails with questions and comments, and I will be back in a week or so with another fountain pen item. I picked up the two pens in the photograph below from someone that I suspect used them for parts to add to a group of Kraker produced pens. The nice thing about several of these pens is that some of the parts are interchangeable. The two pens I received were a red/orange Dixie Flat Top and a Black Belmont with red cap top jewel. The black Belmont is the same model as the pen I restored in this post of May 22, 2008, titled Belmont / Rexall and Yankee Cousins. The photo below shows the pens after I have taken them apart. The Belmont arrived complete, while the Dixie was without a feed and nib. I decided that I wanted to restore the orange Dixie more than the Belmont as I already have a similar Belmont, and though I have several Dixie pens, I have none in this color. As you can see, there was significant staining on the Dixie. Some sort of black/gray stain was covering both the barrel and cap. I gently sanded this out and then applied a scratch remover and polish to these areas. The result was a total eradication of the stains. The clip, cap rings (2) and lever were not cheap gold plate, as I always fear, and cleaned up well using metal polisher and then my ultrasonic cleaner. A new J-bar was needed as the old hanging bar had corroded. I removed the base of the hanging unit first and then inserted the long j – bar. Next was the nib…it was a short Warranted 2 nib that has seen better days. I attempted to clean it up, but it was substandard and my suspicion is that it was just thrown on to sell the Belmont. I tossed it and found a larger Warranted No. 2 nib in my nib bin. (nib bin = 2 word palindrome !) Ok, its not a nice Dixie nib, but I am not sure that George Kraker used Dixie nibs on these. It fits well and it’s larger size seems to fit this longish pen. The Belmont barrel, cap, and section were polished and banished to the parts drawers for future project use. I may have a spare feed and nib somewhere, but the Dixie was my focus. Below is the completed pen ~ my first orange Dixie, clearly a pen made in response to the successful Duofold Big Red’s of the day. Given the time frame for George Kraker’s stay in Michigan, this pen was probably produced sometime between about 1925 and 1929. This would confirm its production during the heyday of the Parker Duofold and other large flat top pens. The photo below shows the new Warranted No. 2 nib loaded and ready to write. The pen is a large one, measuring in at 5 3/8″ capped and 6 5/8″ posted. I have seen at least one other color for these. Other than the jade, mandarin, and orange, I have seen a marbled white/brown and black, similar to the Parker pearl marlbed Duofolds. I will have to keep looking….